But that’s not constructive criticism. Those are just negative responses that lead to dead ends, and that kind of disruption isn’t going to get you very far in business. The object of any successful enterprise is to make things better. Criticism is necessary for this of course, as you need to tell your team when they’re doing something wrong, but it takes a special kind of criticism to identify the problem and provide solutions. That’s called constructive criticism. It’s one of the many tools to help, not hinder, the progress on a project. And when you’re being constructive, you’ll also find that the person you’re criticizing will be a lot more open to following your direction, instead of just seething and making matters worse. Constructive criticism is a process to help improve something through a valid and well-reasoned opinion. It doesn’t stop the conversation in its tracks like pure negativity can. And that’s the secret to constructive criticism; it’s criticism that’s couched in positive observations. You don’t want to alienate someone by just pointing out what’s wrong, so spend some time noting the good things. This shows you’re speaking to the work, not the person, and acknowledging where the work was done well. There are as many ways to give constructive criticism as there are reasons to criticize; that’s why it’s considered an art. You’re responding in the moment to a problem and thinking on your feet. You’re improvising, but not without a strong foundation of experience and skills to support your advice. Still, it helps to have a template or at least some examples to follow. You might have to adjust to the situation and the people involved, but the following constructive criticism examples are a good framework. The sandwich referred to in this example is careful criticism placed between a couple of slices of positive reinforcement or praise. You begin by focusing on the strengths and what you like. People want validation, so this will soften the blow of the criticism. But then you must criticize and point out the things that you don’t like or are not working. You can phrase it like areas that need improvement, which sounds better than being negative. Then you end by restating the positive comments you gave initially and how much better things can be when the criticisms are acted upon and improved. Okay, you see the sandwich analogy, and like a sandwich it’s a tasty way to deliver criticism. It’s like sneaking a slice of tomato in the turkey sandwich for your kid who hates tomatoes. It goes down easier. By starting positive, you show that you’re on the side of the person who is getting the criticism, and by ending positive your criticism makes the person want to improve and act, rather than feel hurt. General criticisms are often too broad to act on. The more details, the more a person can respond to the criticism. You can criticize someone’s overall work, but what does that mean? They’ll either blow it off as vague and simply internalize it, or they won’t understand which aspect of the work you’re upset with and waste time fixing something that doesn’t need fixing. But if you get specific and, for example, say, “The way you’re hammering is wasting nails. Hold the hammer like this, and you’ll drive the nails home every time.” Now the person knows exactly what it is that you are critiquing. They also know why and how to improve the task and resolve the criticism. It’s really that simple. Managers often forget to provide the necessary details because in their head the whole thing makes sense. They know all the points on the line, so they jump ahead thinking others will follow. But don’t assume. Be specific when delivering constructive criticism. Don’t take any shortcuts, but provide the pertinent information concisely and clearly. A problem with criticism is that often it is just anger or frustration being released. It’s like steam; you got to let it go or you’ll blow. For example, let’s say you see a movie that triggers you, and you tell everyone around you very loudly that it’s terrible. Okay. But what can the filmmaker do to improve their next movie based on that criticism? Not much, because your criticism is subjective and not actionable. Therefore, any constructive criticism must be based on something that the person can act on and improve. It’s the same as criticizing the situation instead of the person. You want improvements, not insults. So, you should detach the person from the situation, comment on the issue, refrain from making it personal, and then offer that person an avenue for improvement. If you criticize a person about something they cannot do anything about, you’re just going to erode morale and make that person feel awful. But if the criticism is constructive and based on actions they can take to improve a poor situation and make it better, then the person will feel empowered. They’ll act. When the situation has been righted, they’ll feel accomplished, and you’ll praise them. Everyone wins. Whenever you criticize, do your research and never assume anything. It doesn’t make sense to speak about something you’re not certain about, especially when you’re a manager. You want to stand on facts or else your footing is faulty. Nothing constructive can come out of that. The truth is that there’s no need to make assumptions. There’s plenty of fact-based evidence in any project that will serve a manager well when speaking to a team. Maybe you think that because of your experience as a manager you know what’s going wrong, even if it’s not evident in the data. Well, you might be right, but you might also be wrong. If you’re wrong then you’ve done a great disservice to your team and tarnished the trust that is essential to good leadership. Don’t assume, offer practical recommendations that they can act on immediately and focus solely on improvements. That’s constructive criticism. Being able to offer constructive criticism rather than merely saying something is wrong is part of what makes a great leader. 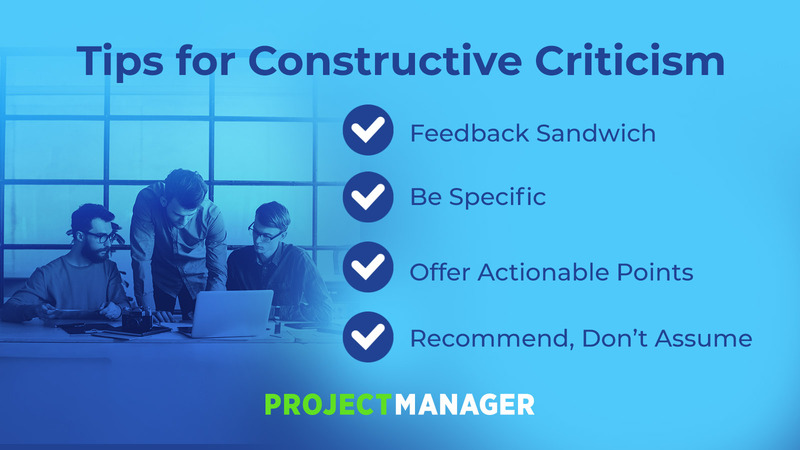 But if that leader is without the tools for the job then might we offer some constructive criticism: try ProjectManager.com. Our cloud-based project management software makes collaboration, scheduling and reporting easy. Give yourself and your team the tools they need to improve by trying ProjectManager.com for free with this 30-day trial.